Hello and good day. I watched this video and it was awesome. I got the emulator up and working and all the games properly configured. I went to launch these in Launchbox or to sync them with the front end and when launching a game it just launches the FS-UAE launcher not the individual game. I then went and read Eirulan's UUID Launcher section from your video and then imported games via that way and now it seems to work great. I was wondering how you separate the Amiga games section with the Amiga CD32 though? Since the games all work under the same emulator they imported under Amiga tab for all the games. Thank you again for your time. @Zombeaver, i'm finally gonna give Amiga a crack and try following your video. this thread is 6 pages long. is the video good as-is or should i read all 6 pages for more details? The video is still accurate. Eirulan's launcher is no longer necessary (it was to address a bug that has since been patched), but that's annotated in the video. Arghh... I have a problem, I must have missed a step or something - please help! I exported the UUID's imported into launchbox all fine. But when I launch the game it just brings up FS-UAE and doesn't load the game at all, I still have to find it and select it in the list to get it to load - what did I miss? Tried everything. Thanks in advance for any ideas or help - love what it does and will be awesome once I get it working properly! Hi! Please help me with mz problem. Maybe someone knows what this error mean (black window, in white window it is said in my language that program stop working, and i can closed the program or try to find the solution in internet and close the program). EDIT--> solution find! I just read previous post and find the solution. salute! Thanks for a great tutorial video! I now have all my Amiga games imported into Launchbox, and it works very well. However, none of my video snaps show up in BigBox mode. The video snaps are named exactly like the lha game files, but FS-UAE reads the UUID file names instead. This means that if I rename a video snap to the UUID file name, the video snap runs fine in Bigbox. However, I would hate to manually rename all my video snap files, as I have hundreds. I would be very happy if an easier solution exists. Any suggestions? However, none of my video snaps show up in BigBox mode. The video snaps are named exactly like the lha game files, but FS-UAE reads the UUID file names instead. This means that if I rename a video snap to the UUID file name, the video snap runs fine in Bigbox. However, I would hate to manually rename all my UUID files, as I have hundreds. They can match either the file-name (in this case the UUID) or the title of the library entry in LB. I've got an FYI page here for more detailed info. In order for them to auto-match, the names will have to match one of those. If you have Emumovies and download new snaps for them, they'll automatically be named in accordance with the library title. That's the fastest/easiest way. Thanks for your very fast reply, Zombeaver! I have read your detailed info, but I do not know how to solve the problem in a fast/easy way. Unfortunately, I do not have a paid membership on Emumovies, so I do not have the option to download new snaps from Emumovies. Is it possible to automate the renaming process or to use some kind of workaround? It is kind of frustrating having collected video snaps for all my Amiga games, but not being able to import them into BigBox. I know there are bulk-renaming utilities out there, but I've never actually used any of them. Bulk Rename Utility and Advanced Renamer are some options. Like I said though, I've never used either one of these personally. This is the same error I get every time. 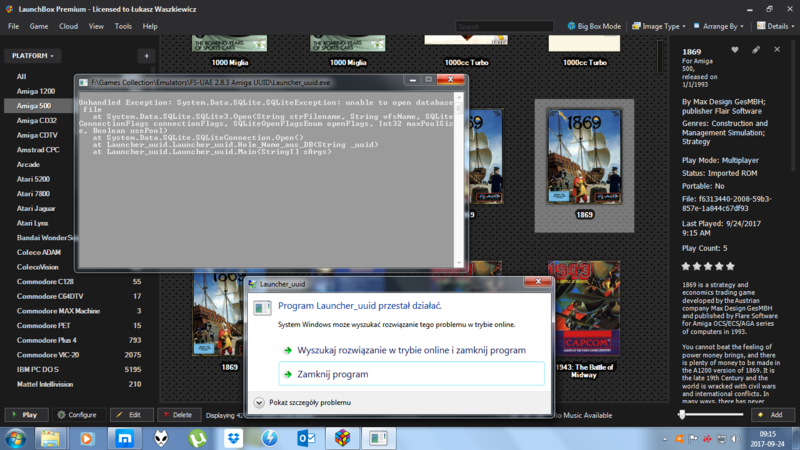 I can run the games through LaunchBox but it does not import the config files for my WHDload files. The games stutter like the creator of the video said. What did you do to fix this, I'm almost completely out of patience, please help. Picture of what I'm getting. I'm also having problems while trying to create two separate emulator entries. When I create the first FS-UAE and then try to create the second FS-UAE UUID when I type in the associated platform (Commodore Amiga) it wants to switch from FS-UAE to FS-UAE UUID. Trying to better explain my problem. FYI you don't need the custom UUID launcher .exe anymore. That was to address a bug with FS-UAE which has since been patched. There's an annotation about it in the relevant section of the video. Both your FS-UAE and FS-UAE UUID emulator entries can be directed to the normal Launcher.exe. They still need to be separate because they still have different checkboxes that are used, but Eirulan's custom launcher is no longer necessary. Thanks for replying. I think I understand the whole process now. By the way, I really thought your original video on FS-UAE was outstanding. Glad to hear it! Have fun! I don't use RL so I can't comment. Does this work with RocketLauncher? If so, does the module support bezels? I think it doesn't. I imported AmigaGamebase. Works like a charm. But in some cases, you probably want to config. WinUae for some particular games. Though, it most cases a default one will work. If you are referring to FS-UAE and RocketLauncher, yes, RocketLauncher has FS-UAE support w/bezel, fade and multi-disk support. Unfortunately, FS-UAE module disappeared from the list. It used to be there. So I don't know what happened. I can see there is no ahk file. I need to re-download it somehow. Bring up the RocketLauncher UI, click on the RocketLauncherUI button, then force an update. I imported my complete WHDLoad collection the other night and noticed something strange. Launchbox imports and downloads the videos from Emumovies for MOST games correctly. For a few hundred games, however, it doesnt't download the video although it's definitely on Emumovies. 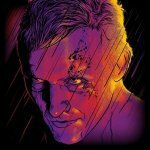 There are currently 1782 Amiga videos on the Emumovies-FTP, but Launchbox only finds 1407 of them. So, for example, the videos for Turrican 1 and 3 are downloaded fine, but not the one for Turrican 2. Speedball 1 works but Speedball 2 doesn't. Other examples are Ultima 6 and Great Giana Sisters. I suspect it has to do with the WHDLoad naming conventions, as the videos on Emumovies have names like "Speedball2_v1.0_2897". But why does it work for most videos then? (Launchbox renames them on import to the "real name" of the game).